A Thousand Oaks, California swim school was the setting of the recent accidental exposure of 19 people to a surge of chlorine gas into the pool area. Likely generated during an equipment malfunction, the gas sent a dozen people with breathing difficulties to area hospitals, according to a news report. A similar event occurred this summer in a Disneyland Paris hotel swimming pool, and too many times elsewhere in the past several years. Sudden and unexpected emissions of gaseous chlorine in aquatic facilities are dangerous to facility staff and patrons, and are at odds with the public health purpose of using chlorine-based swimming pool disinfectants. Most people know that chlorine-based disinfectants are in pool water to destroy waterborne pathogens, helping to keep swimming healthy and safe. No one enters a pool expecting to be overcome by chlorine gas! When all is functioning appropriately behind the scenes at the pool, chlorine-based disinfectant (for pathogen destruction) and acid (for pH control) are injected into a pipeline of water being pumped into the pool following a run through the filter (see the figure at right). But accidental chlorine gas emissions into aquatic facilities can occur when the electrical interlock between the pool water circulation pump and the chemical feed system is lacking, improperly installed, or fails. 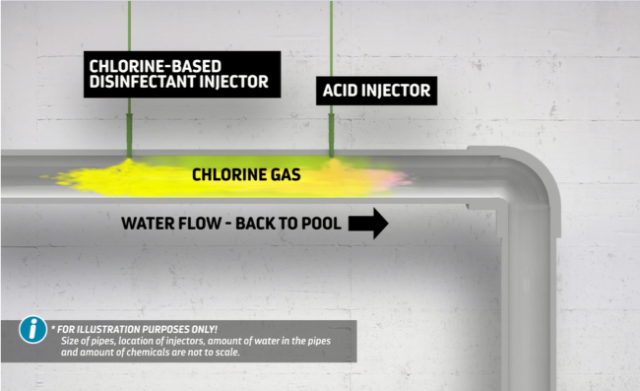 If the pool water circulation pump stops (due to some unforeseen problem or perhaps intentionally for maintenance), but the chemical feed equipment continues to add chlorine-based disinfectant and acid into the “lines,” the two chemicals may react to form chlorine gas (see the figure at right), which displaces pool water in the line, the amount being proportional to the length of time the circulation pump is out of service and chemical feeders are operating. Then, when the pool circulation pump is re-started, this mass of chlorine gas is pushed through the lines and out into the pool area where swimmers or staff may be overcome by an unexpected surge of gas. 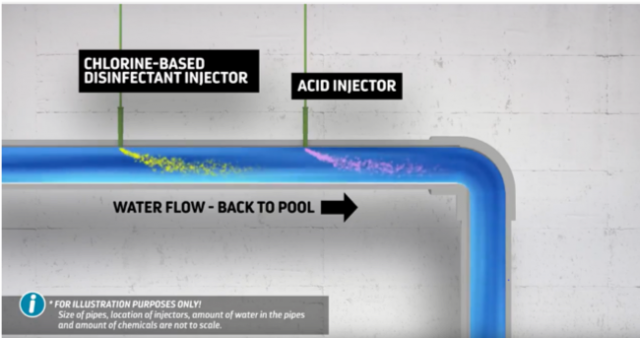 The video points out that an unintended injection of chlorine gas into a pool can be avoided by properly designing the system to include electrical interlock protection. Simply stated, electrical interlock protection ensures that if the pool pump is disabled, the chemical feed equipment will also be disabled, avoiding the development of chlorine gas in the lines. There are various levels of interlock protection, ranging from ensuring that the circulation pump and chemical feed equipment are on the same electrical circuit to installing an interlock safety switch. I had the pleasure of presenting the new video to an audience of swimming pool experts at the recent annual World Aquatic Health Conference in Charleston, South Carolina. It was clear from viewer responses that the video will be well used to help prevent the accidental emissions of chlorine gas at aquatic venues. That’s good news because in the context of aquatic facilities, chlorine chemistry needs to be about public health and safety, not about putting the public at risk. Period. Kevin Boyer is Chief Operating Officer of Poolsure, a mini-bulk supplier of chemicals and professional services to commercial aquatic facilities throughout the southeastern United States and headquartered in Houston, TX. Kevin has been in the commercial aquatics industry since 1996 and is a veteran Certified Pool Operator instructor for the National Swimming Pool Foundation.